Home » Favorite Recipes » Fried Cabbage and Sausage – you can make an old fashioned meal anytime at home. 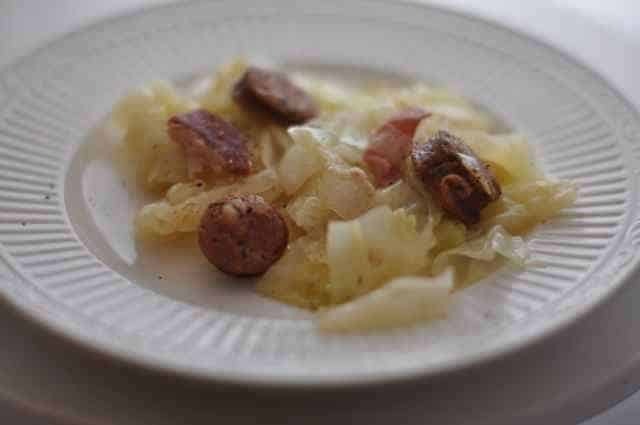 Fried Cabbage and Sausage – you can make an old fashioned meal anytime at home. Main dish with cabbage, onion, bacon, and polish sausage. This is a hearty meal that tastes so good. Enjoy this recipe. Fried cabbage and sausage are one economical meal. Fry bacon pieces with onion, add sausage that is sliced into 2 inch pieces. Add cabbage that has been cut into serving size pieces, cook until tender. Season with pepper, garlic powder & celery salt. Serve over baked potatoes (optional).Thanks to jeep4me for sharing this recipe. Kyle and Ryan your comments are out of order. This is a recipe site not Huffington Post. This is what I am making right now….it tastes awesome, though the dish is by no means low fat. The recipe is balkan, found mainly in central and eastern Europe as a winter meal. Sausages can be replaced with bacon or meat, preferably smoked. Should you not mind my suggestion, give my variation a try: dice one large onion and place it in a preheated pan with about 100 ml of oil. Cook under a low flame for about 10 minutes in an oven proof dish (large dish), until onion is tender. In the meanwhile, finely chop about 4-4.5 kilos of raw cabbage (white, red or a mix of the two) turning the cabbage into….spaghetti like straps. Add the chopped cabbage to the onions (over low flame) and cook until cabbage starts to soften and water appears in the pan (about 20 to 30 minutes). While the cabbage is cooking, use a different pan to fry about 4 smoked sausages / bacon (3/4 kilo) until slightly crisp. Remove sausages/bacon from pan and set aside. Once the cabbage has become watery, take a bowl and mix 50 ml of tomato puree, a tea spoon of black pepper, a tea spoon of paprika (hot if you like), half a tablespoon of thyme, about one and a half tea spoons of salt (only if sausages/bacon slightly salty. Otherwise, add salt according to taste, separately) and 300 ml of warm water. Add the mixture to the cabbage and onions and stir vigorously and also throw in 2 or three bay leaves. Leave all to cook for another 20 minutes or until liquid starts to reduce. Add the sausages and another 200 ml of water, stir and place the pan in the oven for half an hour under low to medium flame. The surface of the dish will start to crisp (but not burn) when done. Remove pan from the oven and sprinkle freshly chopped dill (one tea spoon). Thank you for your recipe. I will definitely have to give this a try. I have a head of cabbage in my refrigerator that I have been trying to figure out what to do with it for awhile now. I am going to try this soon. Looks really good and the ingredents sound yummy.